The location of Cliffview Farmhouse is its best feature - Barndoor Hills Road, is one of Granby’s designated “scenic roads”. The property is surrounded by the 4,000 acre McLean Game Refuge, which features, the amazing East Barn Door Hill Overlook and the West Barndoor Preserve, a spectacular vertical cliff face which serves as the backdrop to the Cliffview Farmhouse. The house is a part of the Valkyrie Stables, a prestigious boarding and riding facility which is in the heart of Granby’s “Horse Country”! The home is a late 19th century, 4 bedroom farmhouse, with a newer contemporary interior design. The open floor plan offers a gourmet granite kitchen (with Viking range), a dining area, and two informal sitting rooms. The front door offers access to the quintessential “farmhouse” front porch! The rear of the home features a large, open and sunny pool table room next to the family room with flat screen TV. An entry foyer has a large coat closet and powder room. The bedrooms are located on the second floor along with 2 full baths. There is even a finished 3rd-floor walk-up attic with lots more potential for extra guests. The home features central air and a warm water heating system. The kitchen is fully equipped with dishwasher, gas range, deep gourmet sink, and a deluxe refrigerator/freezer. The granite counters provide space for 6 bar stools and are great for informal gatherings. Cookware, dinnerware, silverware and utensils are furnished. The exterior grounds offer a covered rear patio with a huge gas grill and picnic table. The walkway leads to a beautiful in-ground pool in season. The views from the pool are stunning, from the cliff to the equestrian grazing pastures. Granby is an up-scale rural Hartford community with great restaurants, thousands of acres of hiking trails, some of the best waterfalls in Connecticut and great family owned farm stands. Dawn and I are an "empty nest" couple with a love for hospitality. 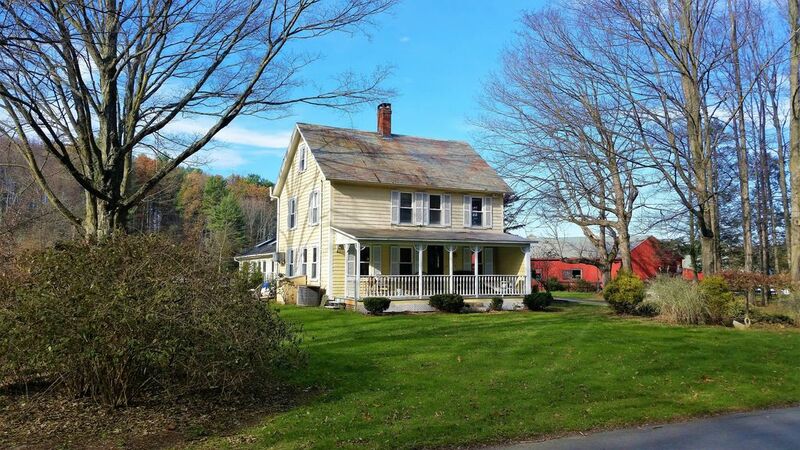 We currently own an older Cape Cod home in North Granby, Connecticut. The property includes our stone guest house which we have had on Airbnb since the Summer of 2017. Dawn has a furniture restoration business and Ken has been in real estate sales for over 40 years. We love country antiques and decorating with a vintage style. Ken is involved with the local historical society and has served on the town Economic Development Commission for over 10 years. We will send you our Guidebook for many ideas of what you can do when you stay with us. A great place to stay for an extended time in a quaint, quiet country town. Located on a 30-acre equestrian center, this 19th-century farmhouse has the flavor of the past with many updates including central air, a Viking/granite kitchen, 3 baths and 4 bedrooms plus a finished 3rd-floor attic with even more space! In season, the inground pool and outside bar-b-q area are great. The view of the mountains and horses is unlike any scene you can imagine. Would work great for a short-term corporate home, rent for 30 days in the winter or just come up on weekends for a quiet retreat. Great for large groups like wedding parties, family gatherings etc. Located in Granby, CT; the most horse friendly town in Connecticut. Located on an official town "Scenic Road", the setting is stunning, the house is commodious and great for a corporate stay. View of the Western Barn Door Hill cliff-face! Two separate seating areas for unique conversation groups. Glasses, dishes, pots & pans. Most of what you need for housekeeping. Open area with an expandable table to seat up to 8. We spent several days here using this beautiful farmhouse as our home base. It was spacious and had beautiful horses for the kids to meet and is right by a game refuge if you want to take a walk. The owner met us upon arrival and gave use a quick rundown of everything and even offered to drive us around to get to know the area. I would not hesitate to stay here again. Thanks Ken!